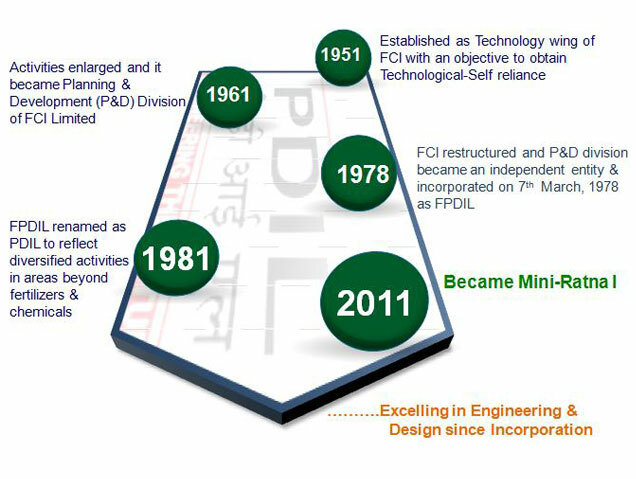 In the year 1951, PDIL was established as a technical unit of Indian Fertilizer Corporation Limited with the aim of achieving technical self-sufficiency. Its activities expanded in 1961 and it became the planning and development division of the FCI (P & D). In 1978, the FCI was restructured and this P & D division came into existence as an independent public sector company, which was incorporated on March 7, 1978 as Fertilizer Planning and Development India Limited (FPDIL). In 1981, the name of FPDIL changed to Projects and Development India Limited (PDIL) for the purpose of providing services in other diversified areas in addition to areas of fertilizers and chemicals. Since, its formation, PDIL has been involved in the design, engineering and construction of almost all the major grass-root fertilizer projects in India.